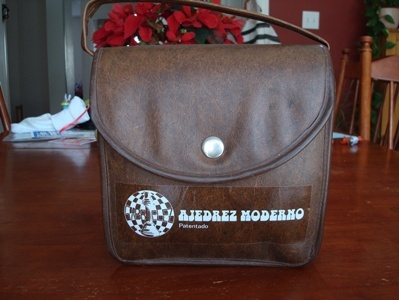 DISCLAIMER: The ideas expressed on this page are the creative work of its author, Jose Carrillo, and they might not be shared by others responsible for this website. The Prime Minister (Bishop + Knight) is not a new piece, it's been known and used for years. It is also named Archbishop, Cardinal, Centaur, Adjutant, Equerry, Hawk, Vizir and Janus, among a few other names, in different games. There are several instances in the past where the Prime Minister was used on different boards under different names. 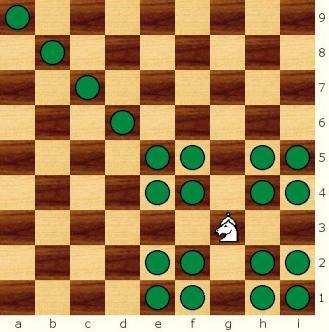 Pietro Carrera in 1617 inserted two new pieces, a Champion, having the moves of rook and knight, to be placed between the king's rook and king's knight and a Centaur, combining the moves of bishop and knight placed between the queen's rook and queen's knight on a 10x8 board. 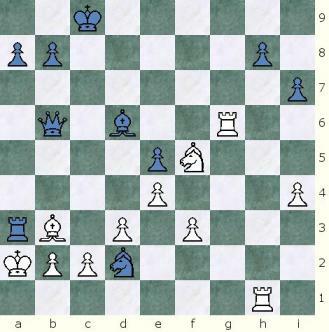 L. Tressan, of Leipsig, in 1840 created 10x10 and 11x11 board variants with an Adjutant (Bishop + Knight) as one of the additional pieces. 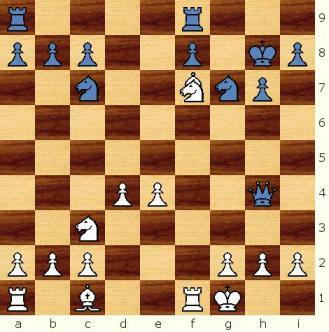 Henry Bird in 1874 suggested a board 10x8 and two new pieces, a Guard (Rook + Knight) and Equerry (Bishop + Knight), the former placed by the side of the queen and the latter by the side of the king, all other pieces remaining in the same positions. 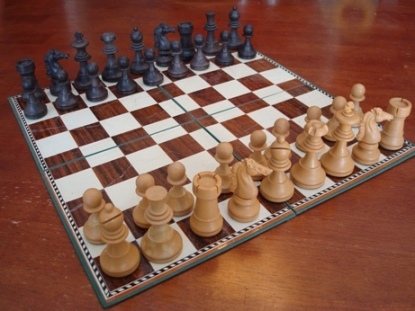 World Champion JosÃ© Raul Capablanca proposed a new 10x8 chess variant after he had gained the world champion title (from Lasker) in the 1920s, and two new pieces, an Archbishop (Bishop + Knight) and the Chancellor (Rook + Bishop), the former placed between the Queenâ€™s Bishop and Knight and the latter between the Kingâ€™s Bishop and Knight. 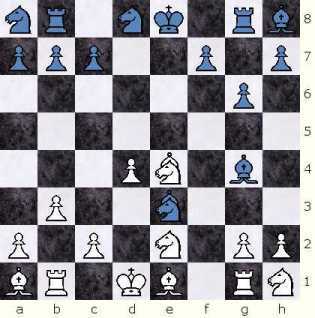 Other recent uses for the Prime Minister are in Janus Chess on a 10x8 board by Stephan Blasius in 1978, and in a chess variant invented by grandmaster Yasser Seirawan in 2007, which uses a Hawk (Bishop + Knight) and the Elephant (Rook + Knight), and is played on the standard 8x8 board. 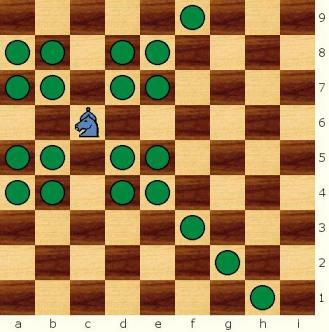 In 2008 the Prime Minister was revived in Modern Random Chess, Prime Ministers Chess and it's random variant; as well as the Prime Ministers Contemporary Random Chess variant. The Prime Minister has the combined moves of a Bishop and a Knight. The Minister has the long range of a Bishop, without the ability of leaping as it moves diagonally; and the leaping carateristics of the Knight in the short range. The two diagrams above display the reach of the Prime Minister. 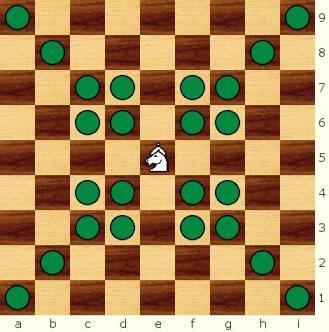 Note on the second diagram a lonely Minister with it's 4-square block attack could mate an opponent's King at the corners of the board. Two more examples. 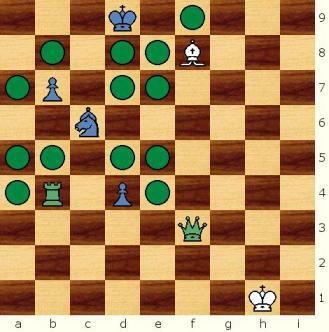 The second diagram shows a Minister fork to the Queen and Rook (in green, to display that they are both under attack), and how the White (or green) Queen and the Black Pawns limit the diagonal range of the Minister, but how it's Knight leaping component is unaffected. The Prime Minister in action! after 19.Qb3+!! 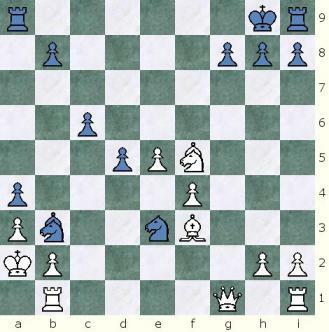 cxb3 20.Mxb3# 1-0 mate! after ... Mxe3# 1-0 mate! Thanks to Luis MenÃ©ndez, from ManatÃ­, Puerto Rico, for introducing me to Maura's Modern Chess, the Prime Minister, and for giving me the original Modern Chess set below as a present. Sorry I overlooked this, Jose. Fergus Duniho did something comparable once, urging designers at least to be aware that RN and BN are not new inventions. More history and more annotations and no new designs at all would be one great way to go. 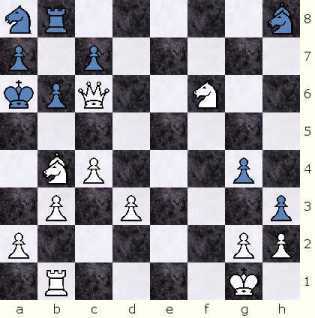 http://www.chessvariants.org/piececlopedia.dir/bishop-knight.html This is no half-measure piececlopedia by Duniho, is it? Sometimes new CVs would appear sounding like the two compounds were just thought up. They always appear together, 1+1=2, about the only case of that oddity. (Exceptions: Janus, Modern) Now in 2015 someone will step up in early spring and say, hey, how about Rook + Knight with Bishop + Knight, and they'll add some tiny nuance or say their board size is novel, seeking plaudits or projectile approval: no coins please. I think the minister pieces made by cutting the crowns from kings look really good. I think the ones made by gluing the components together like totem poles look ridiculous.